When was the last time you finished a book and immediately sat down and wrote out a list of people who MUST read this book? When I finished this, that’s exactly what I did. The first, my kids, then my homeschool co-op teens, then some moms of those teens, then a few scattered friends who I know would get a kick out of this. And then I pretty much went on IG and FB and shouted it from the rooftops there. THIS BOOK IS EVERYTHING!!! Thought provoking and exciting and I can’t wait for everyone to read this. 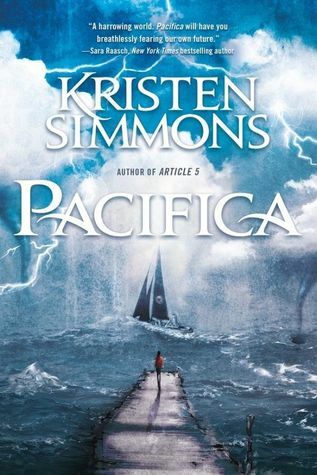 When I first got Pacifica, I almost skipped the author’s note and went right to the story. I’m so glad I didn’t. The author’s note is where the magic begins. It’s where the background story comes from. It’s the first time your heart is squeezed. And it’s definitely not the last. When you read dystopians, part of you thinks, “This could never happen. We won’t let it happen.” But when I was reading this book, I kept thinking, “Crap. This could totally happen. And that would be horrific.” Basically climate change and the affects it has on our planet. But that’s not the hardest part of this story. The people, and what’s happening right under their noses, that’s the hardest part. They thought the government knew what was best for them and they just went along with it. But when the story is uncovered, they realize it’s far from anything they’ve ever heard of. I think the best part of this book was the friendships. I was cheering everyone on. Marin, who was a pirate’s daughter and Ross, the president’s son, set out to rescue Ross’ friend, Adam, the vice president’s son, and it is non stop action. Like stomach twisting action. I couldn’t stop reading, for fear of something happening and I miss it. 🙂 Silly, I know, but I was so invested in these characters, I wouldn’t stop until they found their way back to safety. Now there is a little bit of love brewing on the high seas, but can you blame them? People who’ve gone through traumatic experiences tend to react that way. But it’s teen friendly, so no worries. I have never read a Kristen Simmons book, but if they’re anything like this one, she’s found a new fan and I’ve found a new autobuy author. This story is now added to my ever growing “You need to read these YA books!” list. And all those people who are on my list above, better act surprised when they all get copies for Christmas.